The Lull mattress is an all-foam bed that's available exclusively online. Does it stand out from its ubiquitous competition? Note: Lull's mattress, available exclusively online, is an all-foam bed that has a lot of competition. Does it stand out from its peers in our evaluation? Read our full review to find out. 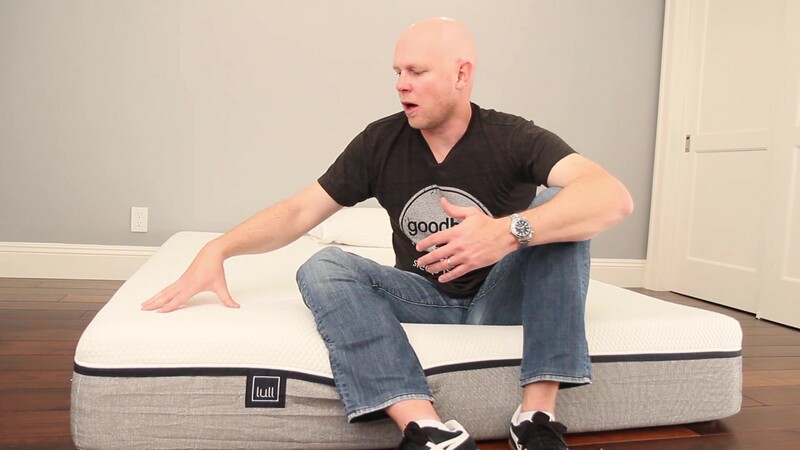 If you’d prefer to watch rather than read, check out our full Lull mattress video review above. GoodBed's Take – Who is the Best Match for a Lull Mattress? Are a stomach or side sleeper than more than about 250 lbs. The Lull mattress is a 10”, three-layer mattress made mainly of polyurethane foam, with a 1.5”gel memory foam layer on top. Even though there is some memory foam in this bed, it shares few characteristics with beds that use more memory foam and give you that slow melting and slow responding feel that memory foam is known for. In our evaluations, we found the Lull mattress to have a Medium softness level, with very good support and spinal alignment for back sleepers in particular and for lighter weight stomach and side sleepers. Motion isolation was a highlight in our standard tests, with both a 16-lb. bowling ball as well as our 200-lb. tester. Part of that owes to this bed’s quick-responding foam, with almost none of that slow-responding/melting feeling you would get with a classic memory foam bed. That makes the Lull mattress a good choice for those who are concerned about feeling a partner’s movements on the other side of the bed. It performed exceptionally well in this respect. Overall, the Lull mattress is very similar to a number of budget foam mattresses currently available online. We found construction to be sturdy, with a nice stretchy cover. It does stand out from its competition in terms of edge support. Foam beds, and particularly memory foam beds, often do not do well in this respect, but our tester felt very stable both while sitting and laying on the edge of the Lull mattress. If kids or pets often force you to sleep on the very edge of your mattress, this could be an important factor for you. Among our concerns: We did wonder whether heavier individuals (250+ lbs.) might sink through the comfort layers of the Lull mattress and bottom out on the firmer support layer of foam, especially in side and stomach sleeping positions. We also had questions about the quality of the foams used. Typically we look to foam density specifications as a guide to durability and longevity, but Lull chooses not to disclose this on their website. Free shipping to your door is included, and there's a 100-night trial period with free returns, including pickup. "Pickup" is significant since some mattresses in this price range require you to show proof of donation before a refund; while that sounds simple, many charities will not accept mattress donations for health-code reasons. Note that the Lull mattress does not come with a box spring (nor does it need one). You can place the Lull mattress atop the support of your choice, including a separately purchased box support, a bed frame, platform bed, or adjustable bed frame. Lull does sell its own wooden box support, as well as a metal frame. One non-performance note: The Lull website has a very nice guide on what to do with your old mattress, from donation (and suggestions on where) to breaking it down and using the parts for other purposes. See the Lull Mattress Disposal Guide. The Lull mattress is made of three foam layers stacked and glued together. The bottom two layers are standard polyurethane foam while a 1.5” layer of gel memory foam is on top. Although it does contain that small amount of memory foam, we found that the Lull bed performs like more of a foam bed, with few of the properties we typically associate with memory foam. This isn't a bad thing or a good thing; it simply effects the performance characteristics of the bed in our estimation. The three layers of the Lull mattress are wrapped in a very sturdy feeling knit cover. It's quite stretchy and is flat and not cushioned/quilted. We tugged and pulled at the cover and found it to be well constructed, with a nice soft feel. We classify the Lull mattress as a Medium in terms of softness overall, right in the middle in terms of softness. This refers to how deeply you sink into the mattress or feel cradled or hugged, versus a feeling of floating on top of the bed. We found the Lull Essential again to be a middle-of-the-road mattress between the two poles, right between that hugged/deep sinking feeling versus a firmer floating on top feeling. While the Lull mattress does have a small 1.5” layer of memory foam as the top layer, it really does not have any of that recognizable memory-foam feel, where after compressed, your hand print takes several seconds to disappear (some describe this as a slow, melting into the mattress feeling). Rather, the Lull bed is fairly quick responding, meaning it recovers its shape quickly; perhaps not as quickly as an innerspring mattress might do, but definitely a lot faster than what you’d associate with memory foam. This also translates to bounce, which we test in two ways. When we dropped our 16-lb. 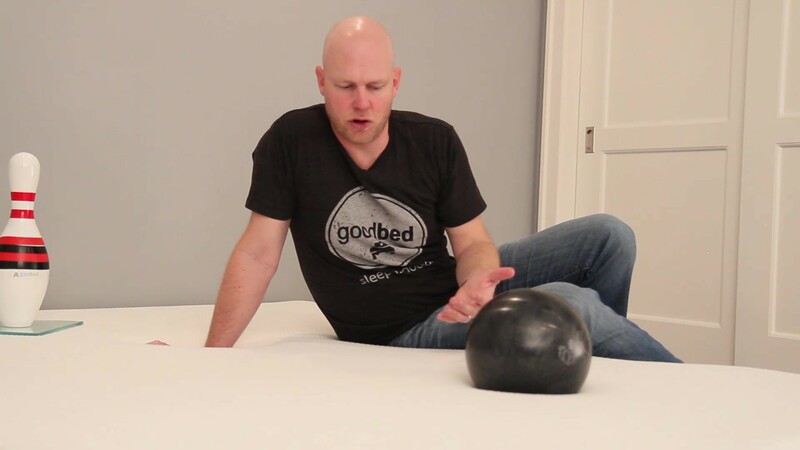 bowling ball in the mattress, it bounced only once, and when our tester dropped his weight onto the bed, he did not bounce at all. This mattress has practically no bounce at all, which comes into play when we discuss motion isolation further below. In our evaluations, the Lull mattresses afforded very good support for back sleepers, and would be suitable for a broad range and sizes of people. The Lull bed was also good in our view for stomach sleepers with the possible exception of those heavier than about 200 pounds, where we questioned whether hips might sink into the mattress’s soft top layers too deeply, bottoming out on the firmer support layer. We also thought the Lull bed would be a good choice for most side sleepers, again excepting those on the higher end of the weight scale. 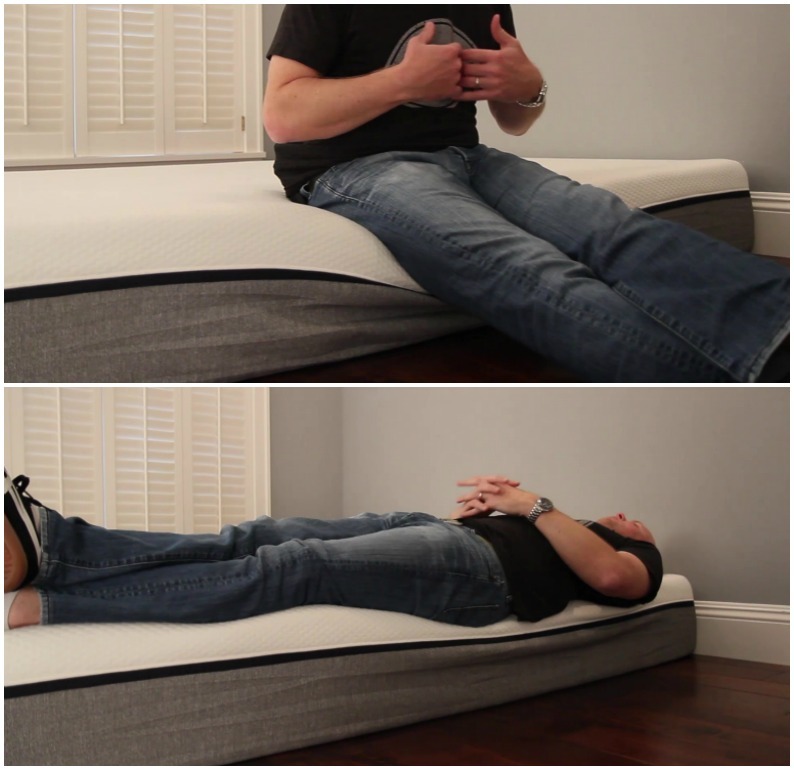 While our tester was on his back, he noted that his hips sank just deeply enough to create a perfectly neutral spine, while he felt the mattress did a nice job reaching up to support his lumbar curve. We feel that sleepers of a wide weight range would have a similar experience in this position on the Lull mattress. Side sleeping was also good for our tester. Shoulders could have sunk a bit more into the mattress, but it wasn't bothersome, and overall spinal alignment was good. We did question whether those much heavier than our tester would "bottom out" and sink through the two softer layers of foam, finding themselves resting on the firm support layer. Achieving good spinal alignment for stomach sleepers can often be trickier as the hips can tend to sink down too far with some mattresses, but our tester felt well supported in this position as well. We did question whether those over 200 lbs. would experience the same support, and suspect that hips might sink far enough to create less than ideal spinal alignment. But for lighter people who sleep on their stomachs, we felt the Lull mattress would be a good match. Overall, we found the pressure relief offered by the Lull mattress to be good. Our tester didn’t experience any specific issues, and we thought that the 1.5-inch memory foam layer was playing a positive role. Again, we questioned whether heavier individuals would sink through the soft foam layers and find themselves resting on the harder support layer. The same goes for people who are broad-shouldered or broad-hipped. With a bowling pin standing upright on the Lull bed, we tested motion isolation by dropping a 16-lb. bowling ball on it, as well as the whole weight of our 200-lb. tester. In both tests, the pin didn't move. For that reason, we felt that the Lull mattress would be an excellent choice for couples who don’t want to feel their partner getting in and out of bed. If you tend to overheat in bed, foam mattresses in general are unlikely to be the ideal choice since blocks of foam don't typically allow for optimal airflow. In that case, an innerspring or hybrid (innerspring plus foam) bed may be a better choice overall. Because you don't sink too deeply into the Lull mattress, more of your body is exposed to the air, an aspect that will help with heat dissipation. The top layer of memory foam is infused with gel, and gel is a conductor, so that can help the mattress feel a bit cooler as well. If overheating in bed is an issue for you, and you’ve experienced it with other mattresses, other models have features that are specifically intended to address this, but for most we don’t expect heat to be a problem with the Lull bed. Foam mattresses aren’t typically very supportive along the very edge of the mattress—important if you like to sit on the edge of the bed, or if you tend to sleep along the edge. But we found the Lull mattress to be better than competing budget all-foam beds. When laying on the very edge of the mattress, our tester felt stable, and did not feel that he was sliding off to an excessive degree. If you tend to move and change positions a lot over the course of a night, ease of repositioning will be a priority for you. Our tester did experience any problems at all with moving around or rolling into a different position on the Lull bed. In the case of the Lull mattress, the company makes no claims about the use of natural materials, however all of the foams used are certified to the CertiPUR-US standard, which verifies that a material has low VOC off-gassing as well as a lack of chemicals and other substances regulated by the CPSC. The fire sock and cover are certified to the OEKO-TEX standard, which asserts similar minimal off-gassing. We did not specifically test the Lull mattress on an adjustable bed frame. However, the company says that using the bed on an adjustable frame is just fine; it will not damage the mattress or void your warranty assuming the frame is properly supportive. The Lull bed is a 10-inch mattress made of polyurethane foam along with a 1.5” layer of gel memory foam as the top layer. It includes a sturdy, yet soft and stretchy cover that stood up to our pulling and tugging. The mattress comes with a 100-night trial period with a full refund and pickup of the mattress should you decide to return it. When it comes to estimating the comfort lifespan of a mattress, we tend to use foam density as our best, albeit imperfect, predictor of how long a foam will retain its shape and resiliency. However, Lull does not disclose the densities of the foam used in this bed. So we can't hazard a guess as to how long this mattress might last. It does come with a 10-year warranty, which should give some assurance. The Lull mattress is competing in a crowded field, with a number of other all-foam mattresses in the same prices range, and offering a similar trial period and return policy. The Lull bed is a 10-inch mattress; some similar beds in this price range measure around 8.5 inches. In our evaluations, the Lull mattress proved itself a good performer all around. Motion isolation, edge support, back support, and ease of movement were all just fine on this bed, and we think it will suit a wide variety of individuals in a range of sleeping positions. For that reason, it could be a good choice for couples who sleep in different positions, and it's a particularly good choice, in our view, for those sensitive to being disturbed by a partner's movements. Taking all that together, from a performance standpoint, we’ve reviewed other beds that in our view were better for certain types of sleeping, had better pressure relief, had more plush covers, better edge support, etc. And some of those mattresses cost just a couple of hundred dollars more than the Lull mattress yet offer measurably better features. Even so, for a wide range of people of average size, the Lull bed is a low-hassle, basic mattress that comes with a solid 100-night trial period and 10-year warranty. Lull includes free delivery, which is not particularly unusual among its competitors. Lull offers buyers a 100-day trial period. Returns within the trial period are free, with pickup of the mattress included. Read more about the Lull return policy on their website. One of the biggest, if not THE biggest complaints about any mattress from consumers regards body impressions — the inability of a mattress to spring back, eventually creating a low spot/sinkhole in the mattress. As such, mattress warranties all contain a term defining how big a sag or ‘body impression’ (measured when no one is on the mattress) is considered a defect, and thus covered under the warranty. The industry standard for mattresses is generally between ¾” and 1.5”. Lull has chosen to cover indentations that meet or exceed 1” for its mattress, which is the average for foam beds Practically speaking, that means any softening or sagging would need to be at least that deep before the warranty would offer you protection. See Lull's warranty policy. Summary: Is the Lull Mattress Right for You? The Lull mattress is a basic but solid foam mattress that will be suitable for a wide range of people, based on our evaluation. Here’s who we think the mattress is best for, based on our tests. Is the Lull bed right for you? Take our Mattress Match Quiz to find mattresses that fit your needs, based on your preferences and price range. Looking for more on the Lull mattress? Visit Lull.com. Is this budget mattress from China right for you?